For the past twenty years, an otherwise picturesque small town has been plagued by a series of mysterious deaths. Teenager Bobby inherently senses that the menacing barn he passes everyday on his way home from school may somehow be linked to the mysterious events that overshadow the daily lives in the town. Often times short films, particularly those in the horror genre, lack any depth or substance. They don’t require or even allow their viewer to think beyond the surface level of the action playing out on screen. When the credits roll, the film is instantly forgotten. However, The Barn offers a refreshing change of pace for a horror short as, ultimately, it is film that begs for a repeated viewing or two and certainly challenges the viewer to think far after its conclusion. There are many layers within the plot and virtually every scene contributes to the deeper theme and often things are not as they truly appear. Moreover, there a few surprising plot twists that succeed in jarring the viewer and creating a sense that anything can happen. The performances are effective and believable, particularly from Peter Campbell and Mike Rodway, who portray adolescent bullies who find themselves forcefully thrust into the midst of the town's secrets. It is through these characters that the viewer becomes a resident of this small town, and as the young characters begin to realize that occurrences that have been previously accepted as part of everyday life in the town are actually clues to something much more dark and dangerous, the audience becomes absorbed. 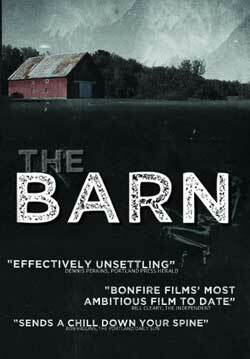 Additionally, from a technical standpoint, the The Barn delivers better than most full length feature films. The crisp and gorgeous cinematography creates an eerie, almost surreal image of the unsettling small town life; the score is dark and foreboding; the direction is detailed and precise. Every aspect comes together to create a truly compelling final product. Much of the film's sinister and ominous tone, which is laid on thick from the first frame, is a result of the combination of a plethora of unsettling imagery, much of it laced with religious undertones. For example, the brief scene where the two teenage bullies stumble upon the supposed town crazy standing knee-deep in the town stream with his arms stretched toward the heavens strikes the right eerie chord, as does any action involving the barn itself and the interwoven scenes of town's church proceedings, led by a charismatic and commanding preacher. But most startling are the ghostly images that appear indiscriminately throughout the film, often times quite unexpectedly. These moments provide the jump scares that are expected from a good horror film. All of these components, as mentioned above, ultimately allow the film to stick in the viewer's mind long after its thirty minute running time is over. The film's final minutes manage to find the balance between being shockingly chilling and disturbingly thought-provoking. To reveal much more would divulge the secrets of the barn. Needless to say, this is a exceptionally constructed film that can hold its own against many recent horror films twice its length. There is an undeniable style and sophistication to The Barn that make it a truly unique and refreshing experience. We at Bonfire Films just wanted to thank you guys at Fright Meter for such a kind review. You guys rock. If anyone out there in the Chicago, IL area would like to catch the film, we'll be at the Portage Theater on March 25th as part of the Indie Horror Film Festival.